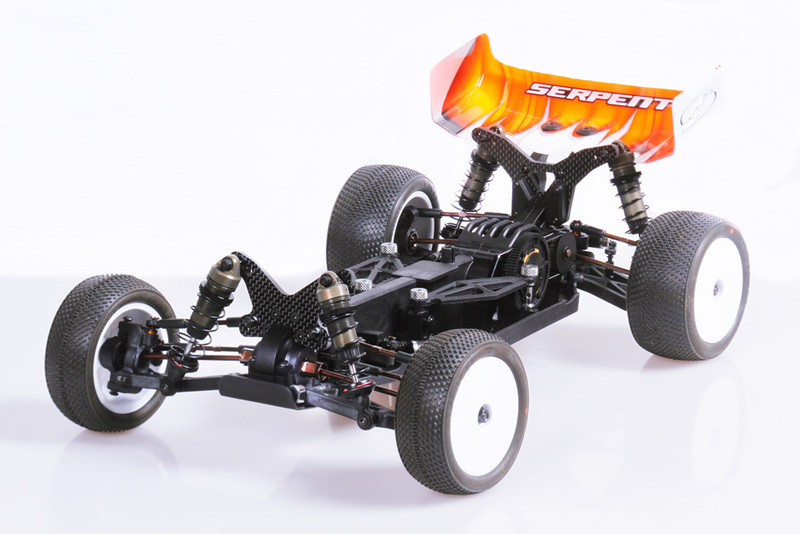 Serpent enters the 1/10 scale 4wd buggy market in a very impressive way, with a new innovative concept. The Spyder SRX4 does not follow the beaten path, but goes in new directions. 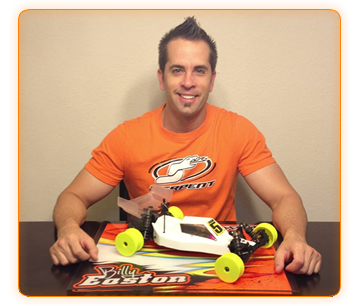 Serpent Designer Billy Easton from the USA, former 1/10 buggy world champion, created this new masterpiece. The Spyder SRX4 combines a very narrow and low design, with a 2 belt-drive transmission, locked-clicker, slipper, geardiffs into a very nice and clean loooking package. 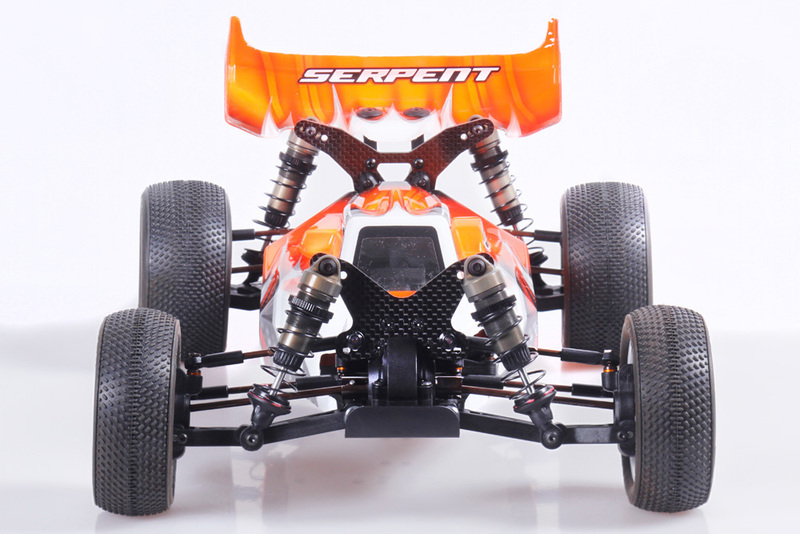 The Serpent Spyder 1/10 range of cars now includes the 2wd RM, 2wd SCT, 2wd MM, and all as RTR verison as well, and now the 4wd 1/10 buggy. 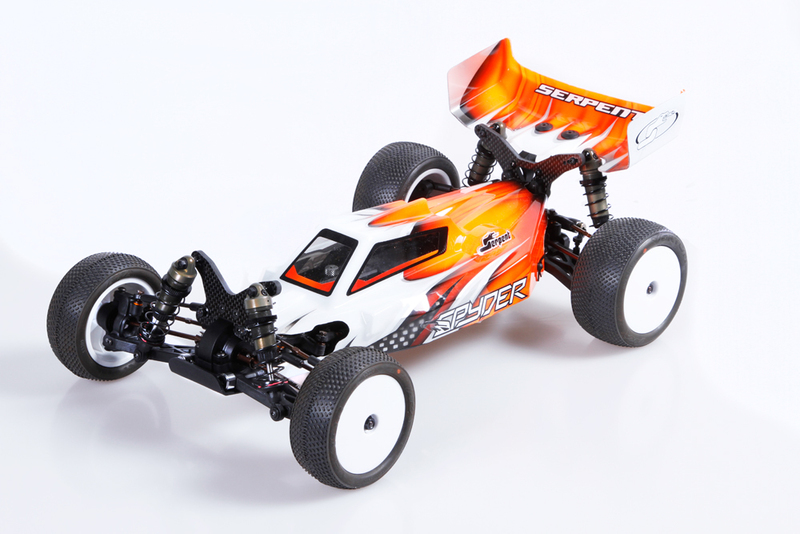 Joern Neumann, Serpent's topdriver in offroad, managed to take the 2015 Vice European Title with a preproduction version of the SRX4. 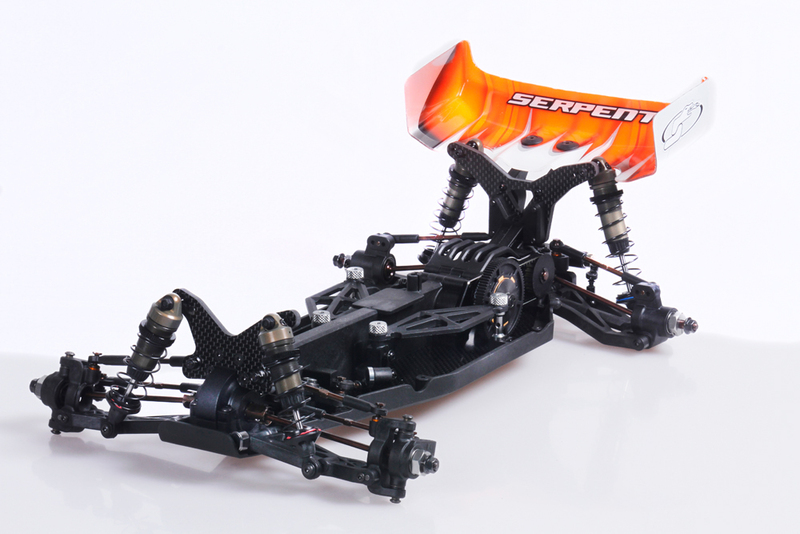 Interview on the Serpent Spyder SRX-4 project with Serpent designer and toplevel racer Billy Easton. 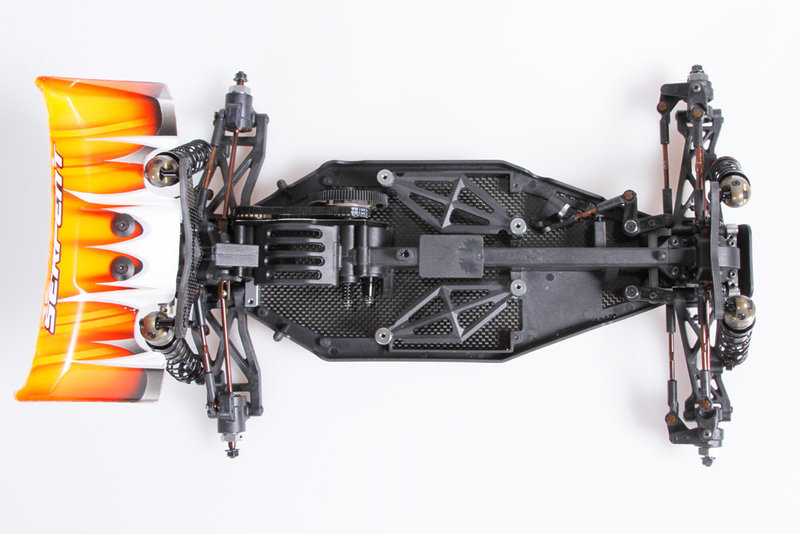 The light 2.5mm carbon fiber chassis has the right flex combined with the composite side-guards / chassis stiffeners and center spline. 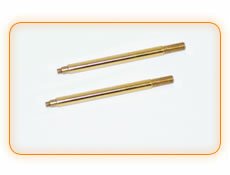 All holes are countersunk to have a fully flat bottom surface. Holes are centered and symmetrical for even flex. The overall layout gives a 42/58 – 44/56 weight balance. Optional weights and brass parts can be used to influence that. The composite central spline in which the front belt runs, creates a very strong chassis stiffener, right in the center of the car. It also protects the front belt very well against debris and insures no belt can skip. The saddle pack battery (not included) is kept in place by 2 easy to use composite battery-covers. Small machined aluminum nuts are included to keep them in place. The center of the car allows plenty of space to mount the most popular speedo and receivers, as well as the transponder. The car also allows enough space to enable nice routing of your cables. 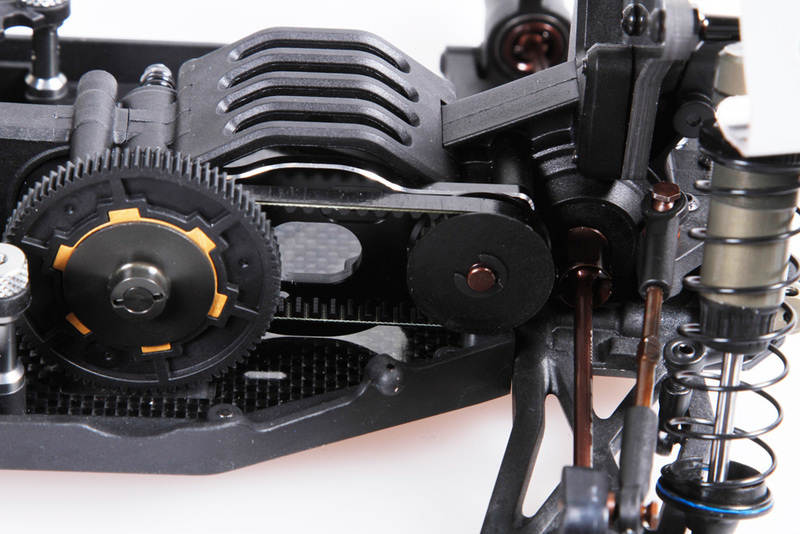 The shorty type servo is mounted on integrated composite stands. Various spacers and horns are included to suit the most popular servo brands. The dual belt system is very durable and light. The Kevlar reinforced front belt is fully captured, so well protected against debris which increases life. The Kevlar reinforced side belt is open due to its location, and the closely fitted body will prevent debris from coming in contact with the belt. The belts run on precision machined pulleys. 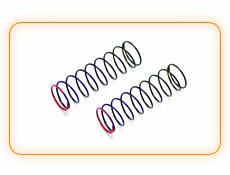 The front belt tension can be changed with eccentric inserts. The 2 compact oil-filled gear differentials front and rear. 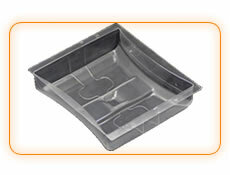 These super smooth units are light and compact and very durable. 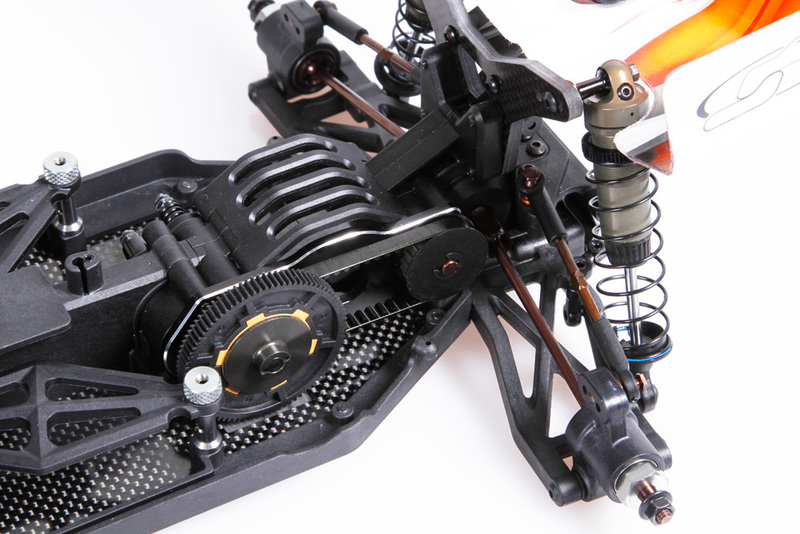 The differentials are also very easy to build and are very low maintenance. 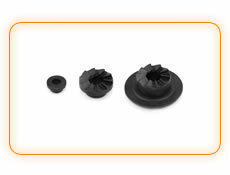 The diff-inserts in the cases allow to you run a low, mid or high position which alters grip. 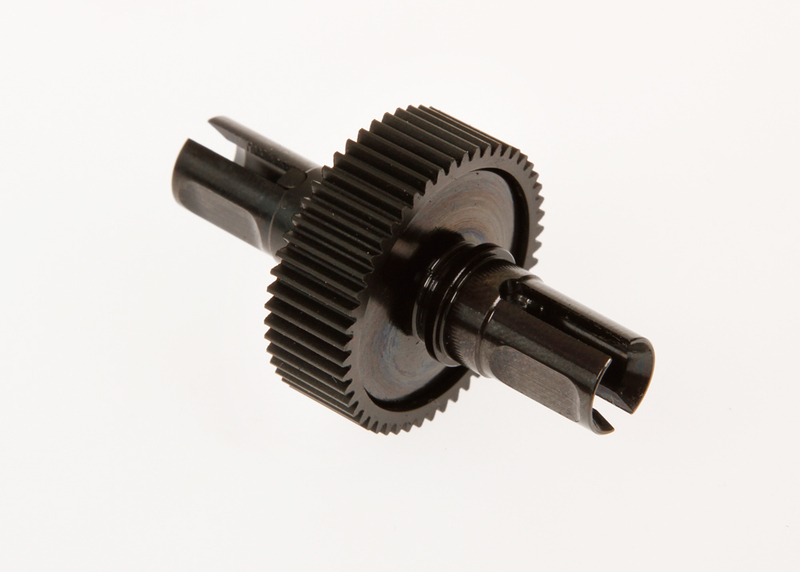 The rear gear diff has a hard coated aluminum gear for durability. 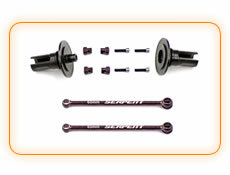 Serpent spring steel CVD drive shafts and wheel axles for durability. Also the lightened differential drive cups are in spring steel. 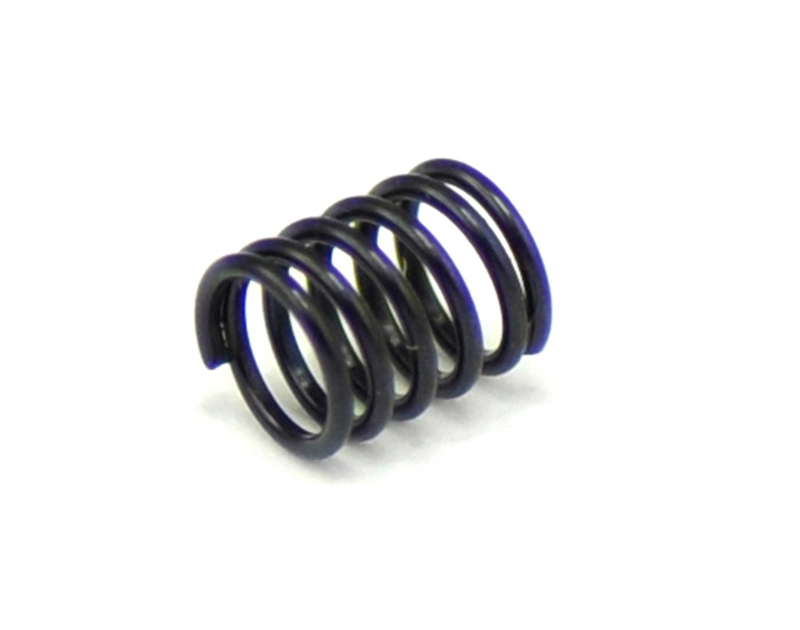 Made in durable and strong Serpent hardened steel. Captured units with rounded end which rotate in small ball-cups inside the suspension brackets, so it’s super free. 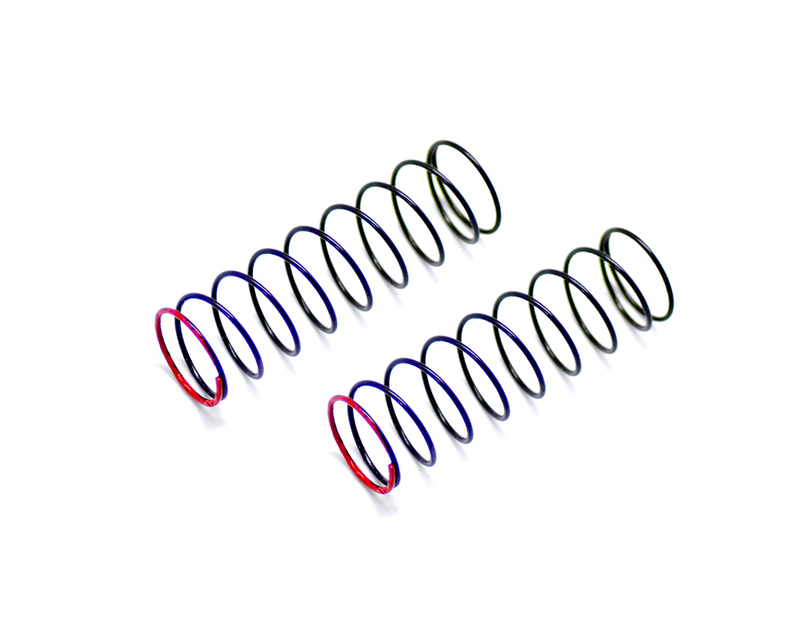 Serpent hard coated shock bodies and shock tops for super smooth operation and durability. 3.2mm shafts with new X-ring package and molded pistons. 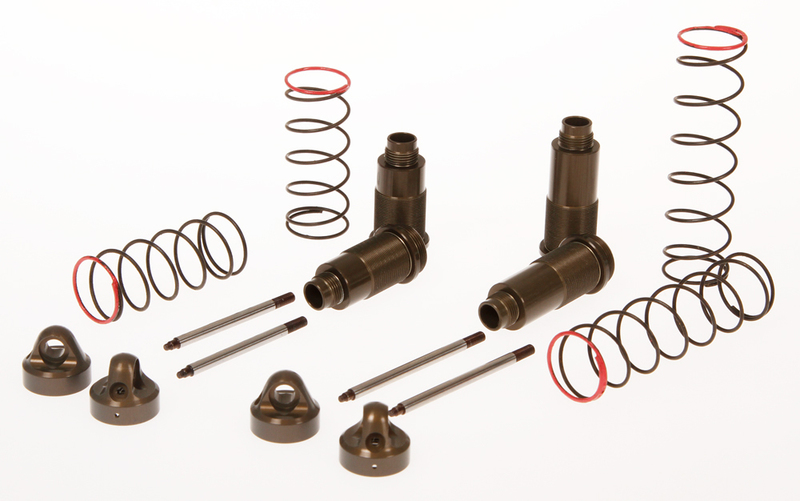 The shocks can be used either emulsion or membrane configuration. 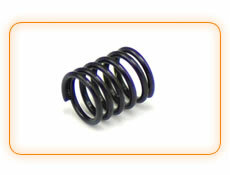 The shock springs have ground ends, checked and matched for perfect equal operation. 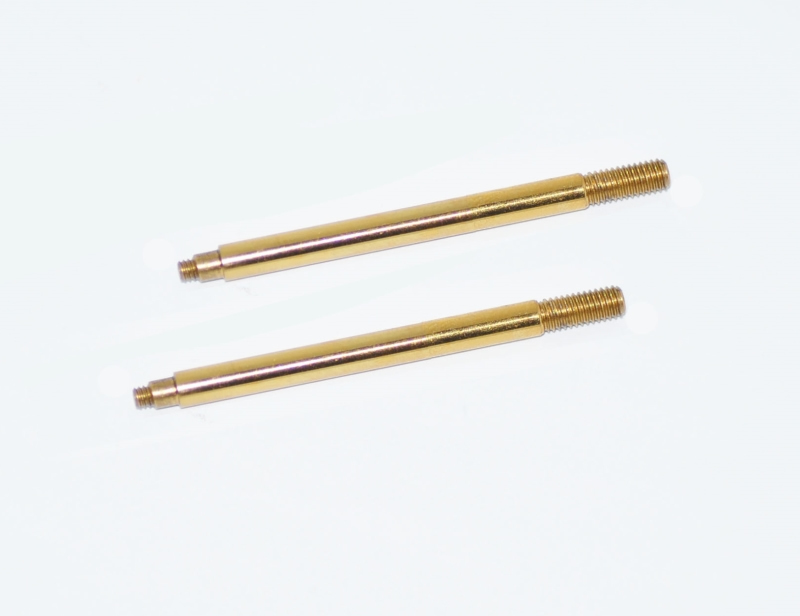 Ride height can be easy set with the threaded collars which have o-rings inside to stay in position. 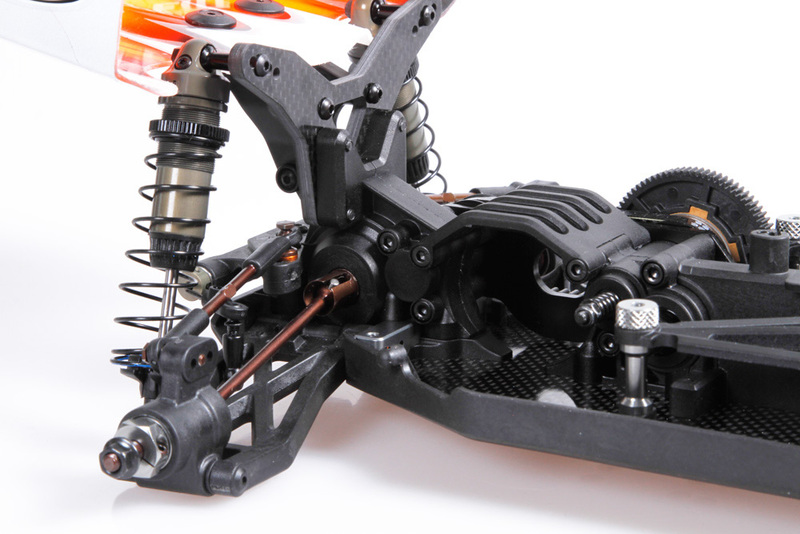 Very durable 4mm thick carbon fiber front and rear shock towers with 4 positions for shock angle. 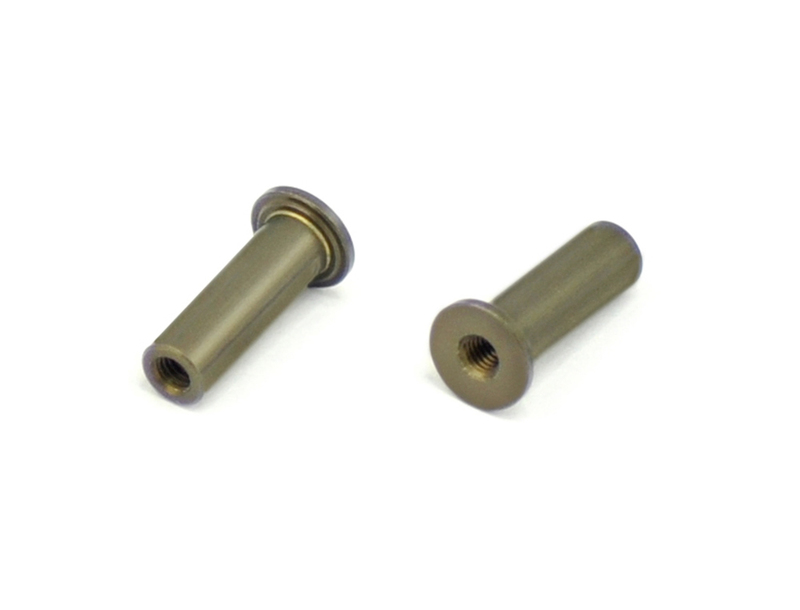 Very durable aluminum shock stays combined with a small bushing and nylon flanged nuts. This light slipper-clutch unit, is a spring loaded 3 pad version, allow to control the power distribution. Standard in the car the “solid clicker” is used for permanent 4wd, which for high grip conditions is best to use. The optional clicker system requires few extra parts only and can be used well in medium and lower grip conditions, to allow the front wheels to spin more free and create more corner entry speed as needed. 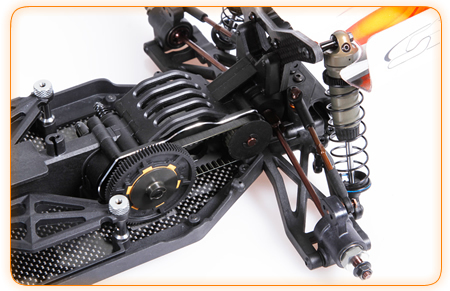 The fully ball raced angled dual axis steering system with integrated servo saver function, offers an almost perfect Ackermann effect. 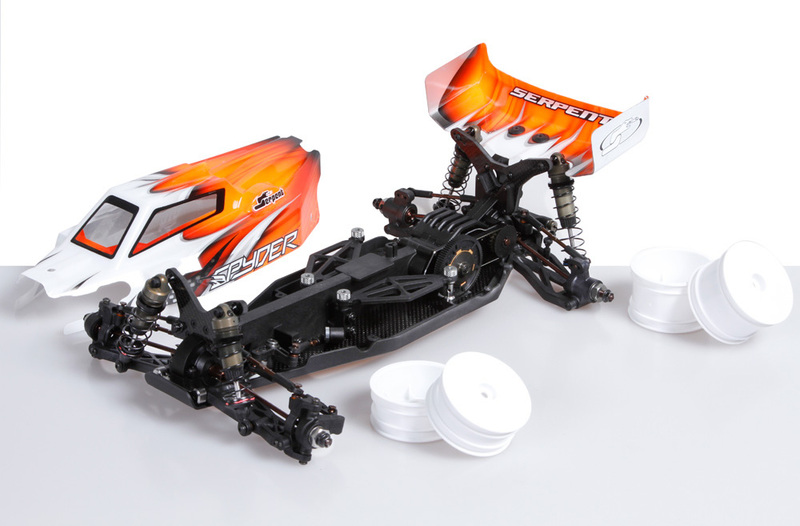 Ackermann can be set with small plates which mount to the steering arms. 3 types included to play with. The angled system will prevent bump steer. The composite steering blocks and c-hubs offer a variety of set-ups with inserts and shaped changeable Ackermann plates of which all 3 composite ones are included. 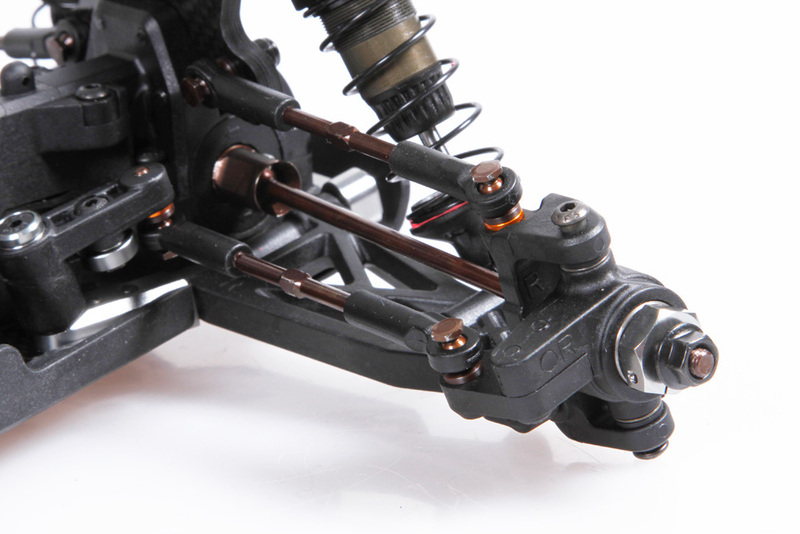 Strong composite lower suspension arms with mounting spots for the optional anti-roll bar. 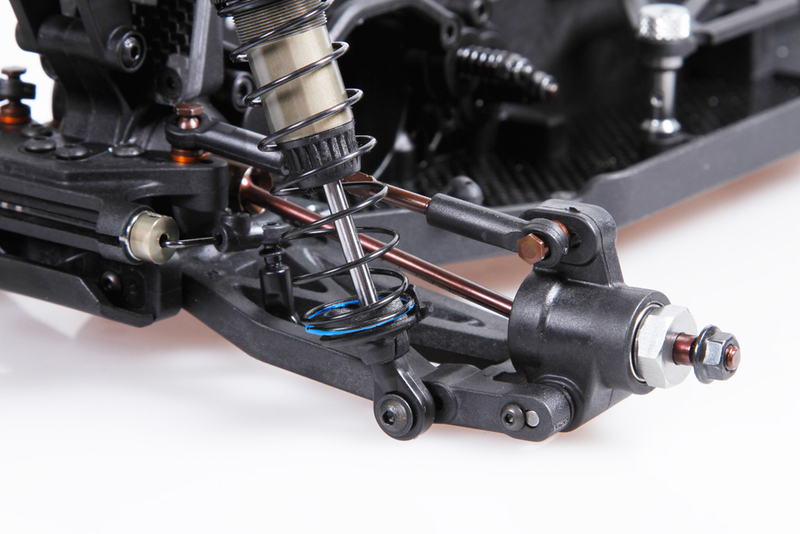 Aluminum suspension brackets with inserts to change set-up. Small but effective composite front bumper to protect the front end. 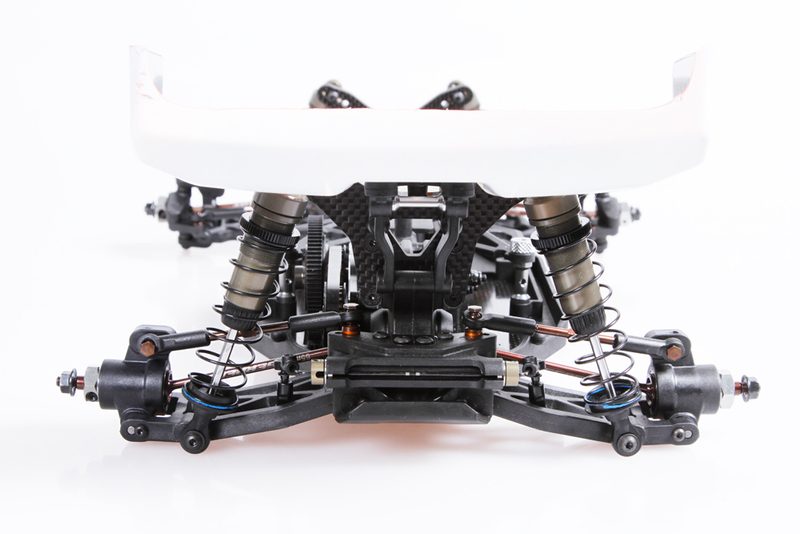 The angled front built in kick up allows for smoother landings. The composite front diff case is a very strong affair to mount the diffs, front shock tower, central spline and chassis too. The rear end shares many parts with the 2wd MM Spyder, which is nice if you also run 2wd. 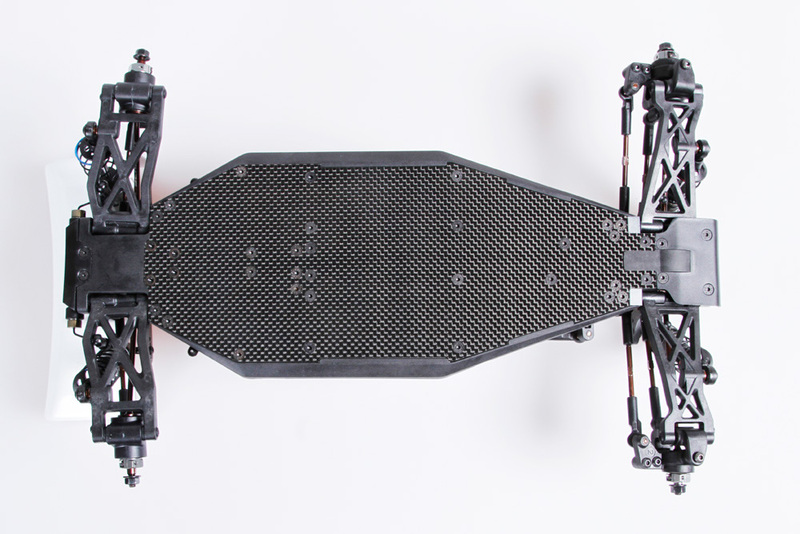 Also here a very sturdy structure with the diff-case as base to mount diffs, shock tower, chassis and motor mount to. Strong composite lower arms. Suspension brackets in aluminum also here with inserts to play with set-up. The beefy composite uprights offer 3 setup position in the top and inserts in the bottom. Both the front and rear allow mounting anti-roll bars. 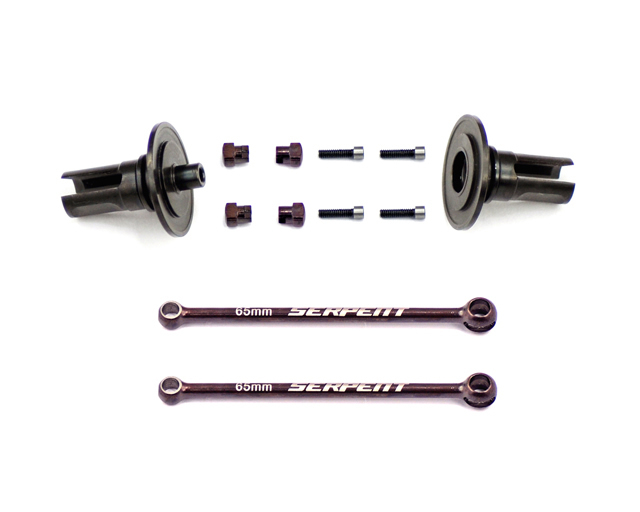 As default Serpent only supplies the rear ball-raced anti-roll bar, as that is used more commonly. The motor is mounted securely to the thick 3mm cnc machined 7075 T6 alu motor plate, which doubles as cooler. 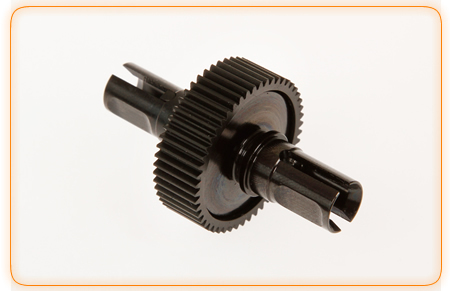 Machined slots allow movement of the motor to fine-tune the pinion/spur gap. The motor holder also holds the shafts of the side belt system, and allows mounting. 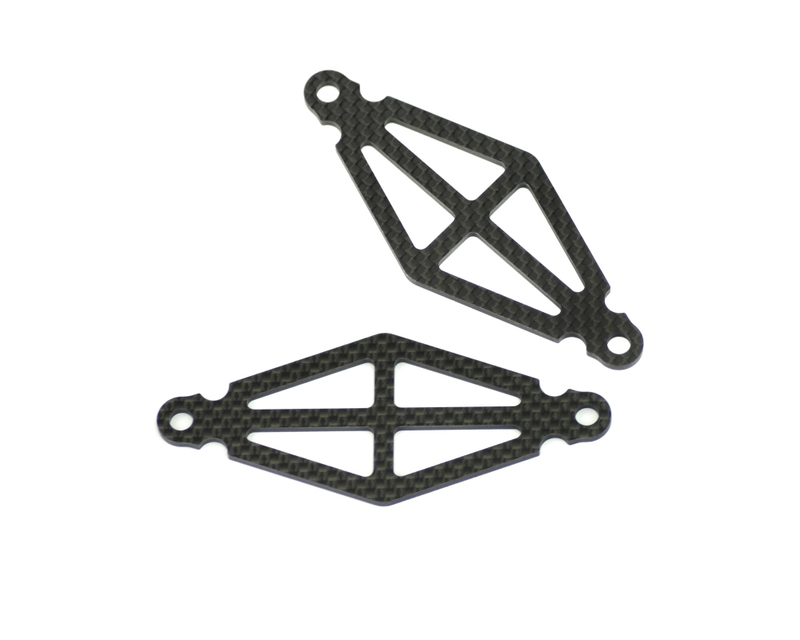 The strong composite body mounts are easily located in case used. As alternative velcro can be added to the side of the chassis stiffeners. 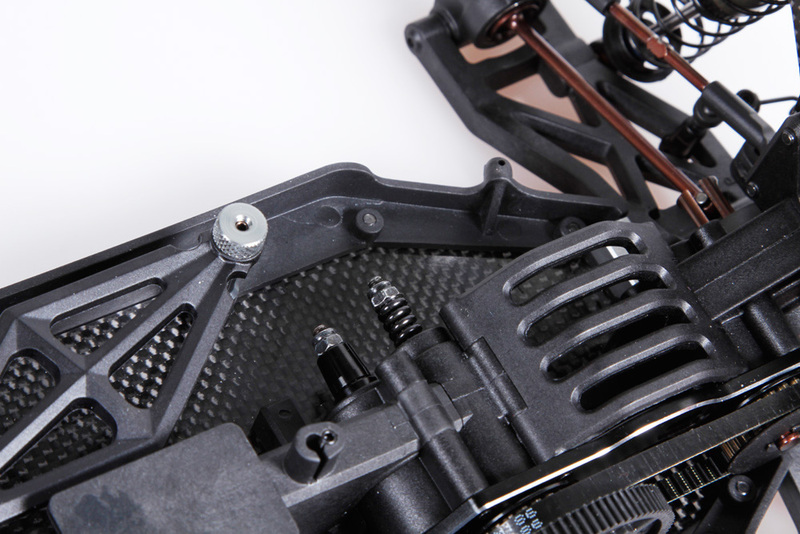 The strong clear polycarbonate wing is mounted to the nylon rear wing holder. 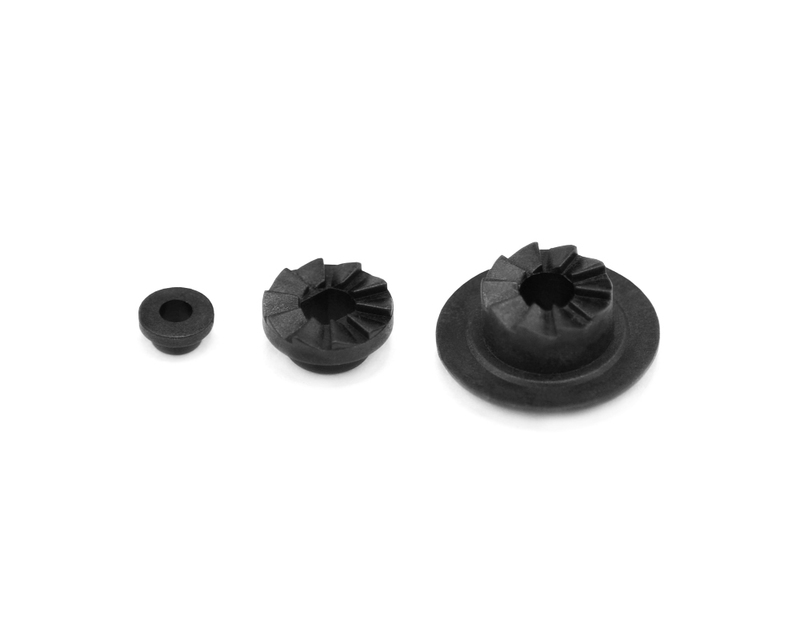 The wing angle can be changed by using the included wing angle spacers: 0, 2, 4, 6, and 8 angle are all included. 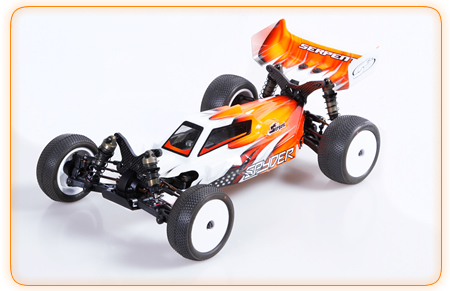 The body is made in the same Avenger style as the 2wd buggy and shares its looks and compact shape. 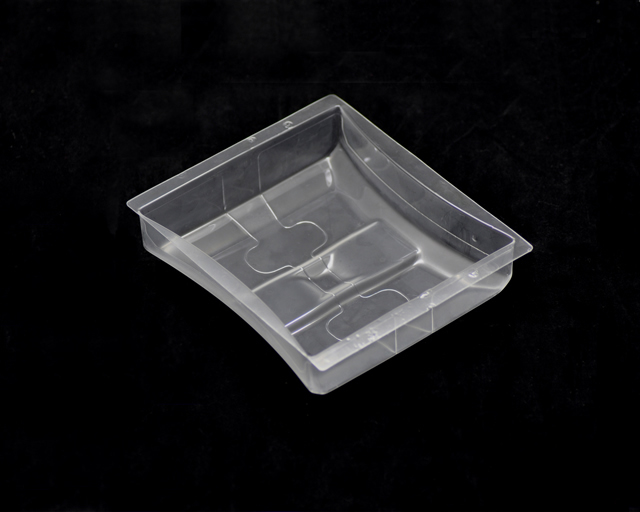 Top quality clear polycarbonate is used. The body comes with a masking sheet. The Spyder SRX4 comes with a printed full color manual which shows the assembly process in steps following the packed bags. The manual also encloses the exploded views and a ref-guide to make it easy to find the part numbers you may need of spares and optional parts. A latest version of the manual can always be found on our website as PDF. A default set-up sheet is included, but more set-ups can be found on our product page under set-ups. 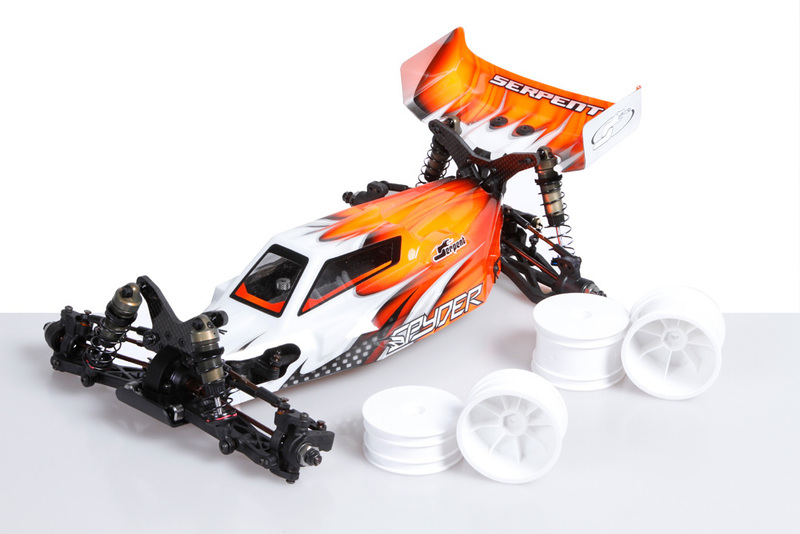 A Spyder SRX decal sheet and a Serpent decal sheet are included. The strong kit box includes the coded bags to assemble the car, as well as the body, rear wing and wheels, manual, set-up sheet and decals. Each kit is carefully packed and a checking decal can be found on the side of the box. OPTION PARTS: Details to follow soon and much more to come.. Shock spring rr astro Rear wing 7.0"